I was looking for new patterns ideas for this year but I couldn’t figure out what I wanted to do. Dragons? more animals? dolls? It took me a while to make up my mind but when I realized that I had not made one single sea animal since I have opened my ETSY shop I knew exactly what I was supposed to do, to focus on animals that live in the sea or by the sea. So this is my theme this year, and I am very excited about the prospect of creating all kind of exotic creatures with my yarn and crochet hook. I just finished my first one, a white seal which is also known as harp seal. For this project, I used off-white yarn and a 2.75mm hook. It was easy to make and I am very glad because I do not want people to struggle with my patterns. I am very happy with the result, I think it turned out really cute. I used 15mm safety eyes and nose but you can choose to embroider them instead with black yarn. I am glad that this little seal didn’t require a lot of materials, it is very basic. I used off-white yarn because pure white gets dirty very fast, I avoid using that tone when I can get away with it. I used bead wire to make the whiskers, but I would recommend using black yarn or anything softer if this was for a child. It doesn’t really need them though, this seal will still look very cute regardless if it wears whiskers or not. It was truly a fun project for me to create, I love seals and especially baby seals. When I decided to work on a “sea animals” theme it was the first thing that came to mind. I really hope people will enjoy this pattern, it is available in my ETSY SHOP. My next crochet pattern project will be a crab. I do intend to make a few fish such as a whale and a dolphin. If you have any ideas that I could add to this theme, let me know! I can’t believe it’s been a month since I last posted on my blog. I have been so busy that I didn’t see time go by. Finally, I am able to take time off to get back to my favorite hobby, crochet. This month I worked on a little giraffe pattern for my ETSY shop, and I can say that I am quite please with the results! 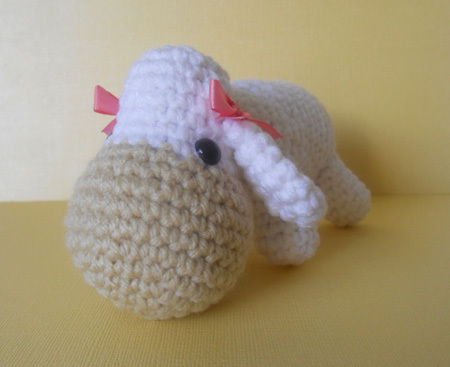 This is my first time trying to crochet a giraffe, I wasn’t sure how I wanted it to look like, there are different ways to do it (long nose, big nose, tall leg or short legs) but I finally opted for something little kids could play with, one with a big nose, long neck and short legs. I will admit that it took trials and errors, I had intended to make the head, neck and body separate but as soon as I finished the head I realized that it would be better to start with the body and seamlessly continue with the neck and head. I tried to make long legs at first, but it didn’t look right. I ended up making them very short, I think it makes the giraffe look very cute and easier to play with. It ended up being about 12 inch tall, which is a good size but not too big. 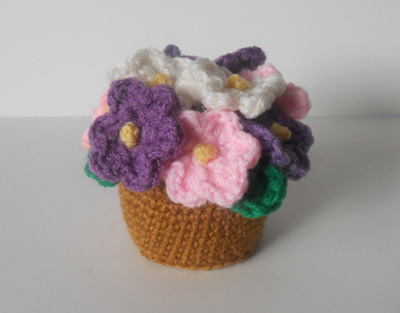 This pattern is available on my ETSY shop. The skill level is easy, I put lots of step by step pictures to help along the way. Now I am ready to start my next project, a different version of the Panda Bear I made last January. 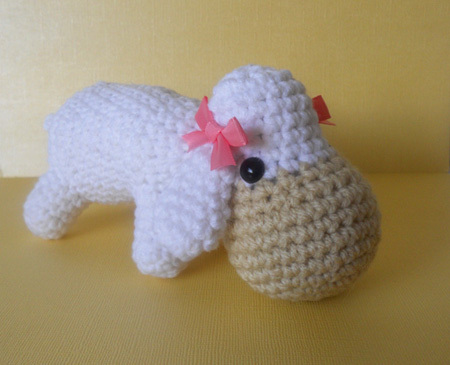 This one will be crocheted with a different type of yarn, and a safety nose. I can’t wait to get started. There hasn’t been much of the winter in California this year, so much so that I forgot which season I lived in until yesterday. It seems like winter had forgotten us and decided to make up for lost times! Storm, rain, you could hardly believe we are close to Spring time. That hasn’t stopped me from dreaming of flowers and greenery. 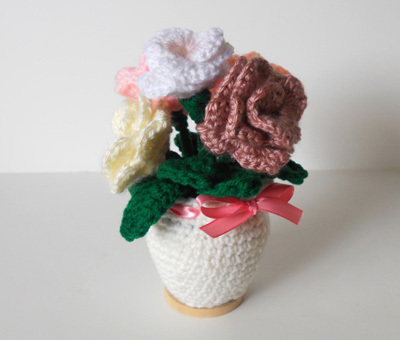 After making my potted plant and Saguaro cactus, I embarked on a new venture with two more crochet plants: a flower potted plant, and a bouquet of roses. The flowers are attached with a chenille stems, and secured to the pot. I even made some simulated water to surround the roses, inside the pot. Even if you cannot see it, the vase is not hollow. It took me an entire day to make it, with a lot of improvisation. Everything is made in crochet except for the wooden stand that I glued at the bottom to keep the vase steady. I think it turned out really pretty. Another improvisation. This one was inspired by one of my plants, even though I forgot what it is called. I am not exactly an expert, and I don’t have a green hand. 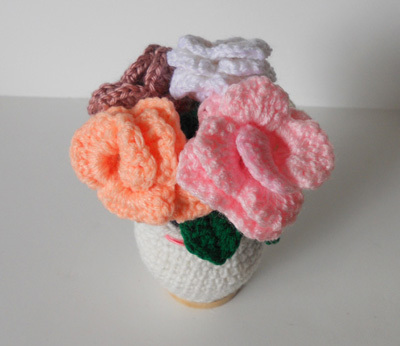 I am much more comfortable crocheting plants than taking care of real ones! Even though I love them. 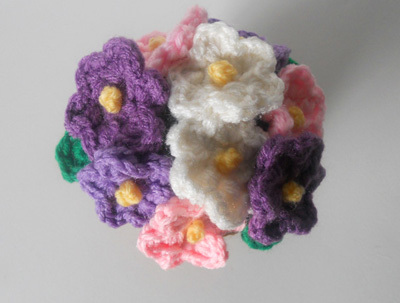 Little flowers in two shades of pink and purple. Top view of the flowers. Just like the bouquet of roses, the flowers are attached to the inside part of the pot, in this case it isn’t simulated water, but soil. The pot was stuffed with fiberfill. I really want to continue this trend on greenery. I am thinking about making a bouquet of tulips, and a bonzai. So many fun things to make, I need to pace myself! The new year has just started but I didn’t waste any time to get back to crochet. I made this little lamb that I can hold in the palm of my hand, it’s only 4 inch. I used Red Heart Super Soft, white and cream color, and a 2.75mm hook. I like to use small hooks to keep the stitches tight. Before I begin, I haven’t tried this pattern yet, even though I am going to! I just couldn’t wait to talk about it, I had to share because we are all starting to roll up our sleeves for the holidays season, looking for craft ideas to decorate the house, or gifts to put under the tree. 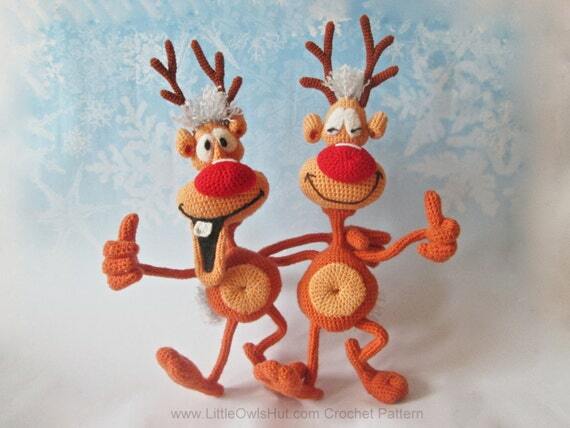 These two adorable and funny reindeers are the work of Ekaterina Sharapova, from Little Owl’s Hut on ETSY. I decided to purchase this pattern for two reasons. First, it is cute, and second, this is a new challenge for me. The reindeers are worked with wireframe, which is a technique that I wanted to learn for a long time, but never got around it. The arms and legs have fingers, which also involves a technique I want to add to my skills. Another good reason to try this pattern, it’s almost time for the holidays! This is a very exciting project, and I cannot wait to post the result (if it turns out well). If you are interested in this pattern, you can purchase it at ETSY: Little Owl’s Hut – Reindeer Crochet Pattern. Note that this pattern is intermediate level.